This MOD adds weapons such as dagger and crossbow. Also add multiple enemy mobs. There are additional elements such as throwing for dagger and guard on Greatsword. Some weapons have strong ones too *. Perhaps there is a problem. I will be happy if you report at that time. I hope your journey will be good. More information on this blog. Although it is more functional than the diamond tool, the durability value is a little low. It has better defense power than vanilla's diamond equipment. Strong defense force and knock back resistance. However, the moving speed decreases. Continuous attacks that do not miss opportunities are possible due to increased attack speed and reduced knockback. Although knockback is small, it gives brief slowness to the person you hit. You can forcibly disarm the weaponed mob with low probability by right click. It can be crafted without a workbench and should be useful in case of emergency. With increased attack speed and low knockback, it will be easy for opponents of the early stage skeleton. Moving speed will rise a little if you hold it in hand. Right click and durable value 2 consumed and throwable. And items of hits in the hit or the ground to the mob. Throwing is higher in power. Originally a dagger for the left hand specialized for defense. Although it can guard, the durability value decreases according to damage. A normal weak sword with your right hand. Having a left hand makes it a sword capable of fast attack. 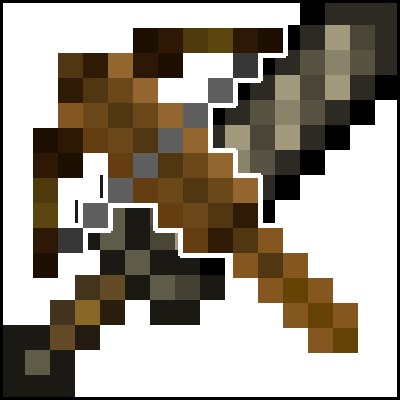 Due to the specification of Minecraft, using the item on the right swings the sword. Therefore, if you have a shield you attack as well as defending. Only enchantments SHARPNESS, SMITE, BANE_OF_ARTHROPODS apply. As usual with the main hand enchantment as usual is applied. Continuous attack with click hold can not be done because wait time occurs. Continuous attacks are made by clicking repeatedly. Knock back is small. Also, the degree of satiety is easy to reduce. No critical hits or sweep attacks occur. As a usage method, let's make it a critical hit in the main hand, Attacking with an offhand sword immediately will cause further damage. You can forcibly disarm the weaponed mob with low probability by right click. You can not guard. Although there is almost no knockback, by making the invincible time shorter instead, continuous attack became possible. The attack speed itself is set to be slow. It is from the idea that "it is funny to do SweepAttack at rapier." It is a large sword that can be guarded. There is no restriction that you have to do both hands, but this guard will take precedence even if you equip a shield. If you attack while sneaking, it will always be a sweep attack. Since knockback is strengthened a little, continuous attacks are hard to decide, but give a short time moving speed reduction to the person you hit. Right click Press and hold for a long time to release the durability value more than usual, enabling a high-impact special attack "charge attack" that pierces the mob with a long reach. Knockback is weak, so it takes time to charge (※ bow degree), so continuous use is difficult. If you leave before charging, it will be canceled. Right click Press and hold and release, you can use the power ambient range attack "Power Stomp" around yourself. A power stomp with a range large and topographically destroyed by the charge of twice as much time as the bow with a small power stomp with a charge of about a bow can be used, but durability value and satiety are reduced accordingly. Normal attacks will also be of great use when always surrounded by sweep attacks. Be careful not to let the domestic animals be defeated carelessly. Spear "Charge Attack" is available for right click long press. Halvard's charge attack is more powerful than spears. You can shoot by reloading. To load it you need to have it off hand. Only crossbow bolts can be used. Do not shoot not to reload. Precision shooting is also possible if you aim, but the collection rate varies according to the aiming time. Shooting immediately will not hit it. When aiming time is steady, particles are generated when shooting. Range is longer towards the bow. It is a continuous crossbow that existed but did not spread. Pull the string by sliding the magazine. Structurally, precision shooting is impossible, but in full auto it is possible to fire up to 8 shots. Shooting can not be done if there is no spare magazine. Reloading will be automatically reloaded if you have it in your hand. It is for medium range because the range is short. It is an automatic reload, but you need to have magazine off hand. It is a large crossbow. Reload time is long, and it is necessary to always take distance to fight alone. Abundance firepower will not be a problem if it is about vanilla. In addition to the crossbow bolt, the following various special bullets can be used. Mob and have the force to penetrate the wall. It is a special bullet of heavy crossbow. To load it you need to have it off hand. A fire is generated at the landing point. There is no topographical destruction. To load it you need to have it off hand. Attacks to enemy mobs and landing points, and explodes after 3 seconds. There is no topographical destruction. To load it you need to have it off hand. It generates a powerful explosion upon landing. As it involves topographical destruction, attention is required for use. To load it you need to have it off hand. It is a special bullet that fires 10 shots simultaneously. It diffuses and fires. To exert a strong power in the near opponent. Bullets can not be collected. To load it you need to have it off hand. It is an explosion arrow using a proximity fuse. It will explode in response to mob within 2 radius blocks. Attention is necessary because the explosion range is more than double the sensing range. There is instant death level power when there is no armor. There is no topographical destruction. To load it you need to have it off hand. While set fire in the vicinity of the mob and terrain, it is a special arrow to a lightning strike to the landing point. Thunder is because it is emitted from the arrow, it is also valid in the underground. Note that a large fire and shoot in the forest! XD To load it you need to have it off hand. Because it intensely knocks back and stabs, it makes the other person temporarily unable to move. The recipe is special, it is a form to add to the crossbow bolt. Because it intensely knocks back and stabs, it makes the other person temporarily unable to move. Moreover, it explodes. The mood is DeadSpace2! Recipe is special, it is in the form to add to the crossbow bolt. It is a crossbow which is capable of full automatic at a higher speed than the repeater bow. It is exactly a shooting weapon reminiscent of Japanese manga "Berserk". Bullets can not be collected. This is also an auto reload. It can not be used if there is no spare magazine here. It is an automatic reload, but you need to have magazine off hand. It is a muzzle-loaded, smoothbore firearm. Although the reload is the longest shooting weapon, it fires bullets at high speed. The shooting precision changes according to the aiming time. It does not hit when shooting immediately after reloading. Unlike cross bow, reloading is possible just by putting bullets in inventory. It is a muzzle-loaded shotgun. At the same time 8 shots are fired. Because it diffuses, accuracy of hit is difficult, but close range fire power is powerful.Unlike a crossbow, you can reload by putting shot shells in inventory. It has a strong knock back. It is a weapon inspired by a certain game of PC engine(TurboGrafx-16). You can throw as far as the endurance value. It will be given the regeneration in accordance with the time and release by right-clicking. Knock back tolerance is given like heavy infantry. It is a magic dagger that attacks even those who have it. Give Wither to your opponent, give hunger here. You can also fire magic bullets with right click. The power of throwing will have the characteristics that vary by time and phase of the moon. The number of dagger thrown will change depending on the time of reservation right click (* maximum 10, consumption of satiety). Is it a lost item of a maid ...? It is the spear of the Valkyrie. Throwing has a homing performance. Explode if you fly for a certain time. There is no topographical destruction. Mob added because it is supposed to be a person living in the world of Minecraft besides the village. Basically anywhere you go on the ground is a mob spawn. RPG's classic monster. Sometimes with a bow. Because the speed of movement is fast, it may be hard to fight. Goblin higher species. In particular features None. It is a hostile mob that mainly inhabit the swamp. It mainly appears in the jungle. It is difficult to fight in the early stages. It is a powerful mob to spawn on mountains and hills. It has a strength of about not win first, without decent equipment. The troll of TRPG is strong. The higher species of zombie. Doors can also be destroyed. It has a poison and nausea. It is like a game with naming but there is no energy drain. Instead, with the hungry. It is hard because of the positioned as a plant monster. Top class of pink hand ropers. It is hard. Have wither. Drop the seeds Kill. Occasionally dropping the Nether Wart. Top class of pink hand ropers. The troublesome mob who has poison. This is a very troublesome mob. Just approaching gives blindness and hunger. If you encounter during the battle with the other mob will be in trouble. Do you want gunpowder? Then you ought to beat this mob. I will never take a block, but I will spark a fireball while warping. It is a golem made of dart. It is a mutant of mushrooms. Have poison. It is a mutant of tree. Have poison. A monster also called a soldier of a dragon's tooth. The detection range is narrow, but it has high attack power. It is a monster that moves only with the grudge that remains in the armor. It is also possible to destroy the door. It is a mob that spawn underground. It is a mob simulating a stone. It has a hardness of appearance as expected. It is a spider in the head of a pumpkin. It is a mob that spawns underground. Small and fast moving. The early stage where the equipment is not in place should be made difficult. Moreover, it is a troublesome existence hunting the surrounding mob. Although it is a mob that only appears in Nether, it is considerably stronger. Both with a long reach, Gozu is high in attack power and HP. Mezu I think that makes us a hard time because the fast feet. It is a mob that appears in Nether. Although it has low attack power, it has a flame-up effect. It is a friend mob that spawns by throwing a Contract Documents. As Iron Golems circulate around, protect the village. Do not despawn. It corresponds to "Biomes O Plenty". However, there are places that I do not understand BiomeDictionary well, so I might spawn at strange places. it looks like its working now, thank you very much! I made a minor update. When crossbow bolt was crafted it has been increased from 1 to 4. Also increased shot shell as well. 1.7.10 and 1.10.2 are also increasing bullets. However, since 1.11.2 makes bullets from iron nugget, it has not changed. This mod's mobs spawn on the surface when I set world difficulty peaceful, but they quickly despawn. It is not so big problem, but I want to fix if you can. Thank you. Could you tell me which mob will spawn? I can not reproduce it. I saw Thieves and Goblins. It maybe cause I use sponge-forge. System Detail here. It did not reproduce in this environment. It did not spawn in the peacefull. It may be due to other mods. Please play as it is if there is no trouble in the play. hey, please make the bolt recipes result to 4 instead of 1. because it's more sensible. thanks. You seem to love crossbows. To be reflected in the next update. Version 1.7.10 was made compliant with version 1.11.2. Musket, Blunderbuss, Bullet, Shot Shell, Contract Documents added. The 0.0.7 version of Repeater Bow and Crank Repeater Bow have NBT errors. It was fixed in 0.0.8 version. Additional ore is vanadium ore. It is rarely generated below Y15. It is necessary to make Damascus steel. Weapons made of Damascus steel are strong, so please try collecting them. Yes. It is generated with new chunks. You do not have to recreate a new world. Hello Iyamato! I love this mod. If possible, could you maybe add a type of gun in the mod? Maybe something like a Musket or Blunderbuss with the same reload mechanic as the crossbows. Thank you. I immediately added a gun. Please use it.